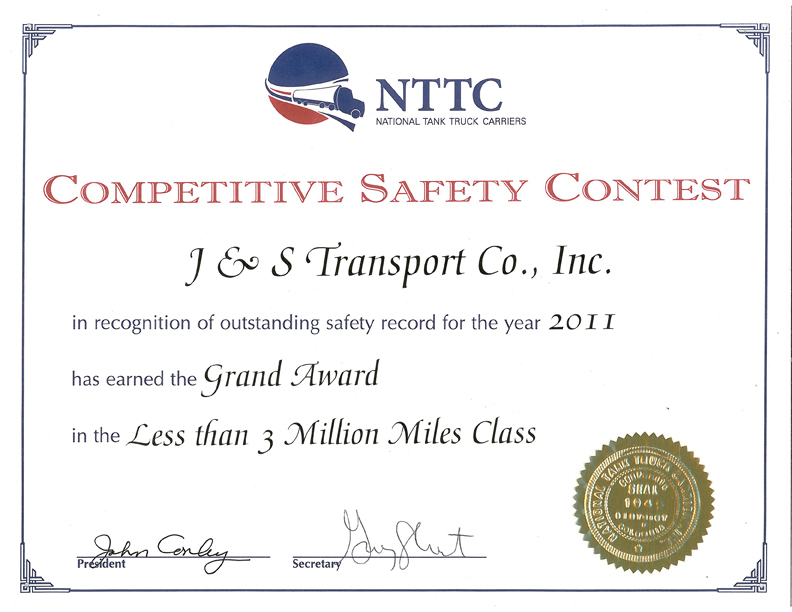 J & S Transport has endured yet another winter with cold winds, snow and ice. As we say good bye to Old Man Winter, we welcome the seed catalogs in the mail, the garden centers at the box stores and our hopes for abundant gardens. 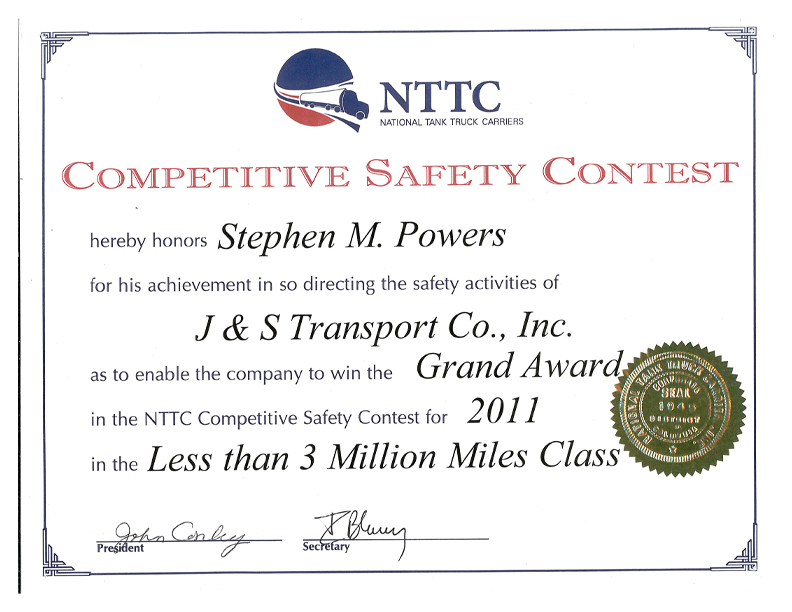 During this time of rejuvenation, we give thanks to J & S Transport, Co., Inc. for providing us the means to support our families with the company asking in return we renew our commitment to drive safely and work injury free. EOBDR’s – J & S Transport has started testing Electronic Onboard Data Recorders to outfit the fleet. The first unit to be tested was from Rand McNally and was installed in T19 to see how it would perform. We are now going to test a unit from Reltima. Our current GPS program is a Reltima product and we look forward to see how both systems interface, especially with our Dispatch system provided by Creative Energies. We will be using these units to replace the paper Hours-of-Service logs. It will take a little time getting used to this new program however, it appears that EOBDR’s will soon be mandated by the FMCSA so we need to get ready. We will continue using paper logs along with the paperless logs until everyone is comfortable with it. The other benefit of EOBDR’s to effectively manage the efficiency of our vehicles. With today’s high fuel costs, we need to ensure each vehicle is operated efficiently and in a productive manner. Hours-of-Service – Come July 1 of this year, there will be changes to the Hours-of-Service Regulations. In a nutshell, the Federal Motor Carrier Safety Administration will reduce the 34 Hour Reset to once per week. This Regulation will also require providing the driver 2 periods between the hours of 0100-0500 at their domicile. Also, drivers will only be able to drive if 8 hours have passed since the end of the driver’s last off-duty period of at least 30 minutes. We will be having meetings to ensure everyone understands these new changes prior to July 1. The new Corporate Office is progressing nicely. In addition to a Drivers’ Room, there will be a conference room and separate Dispatch Office. We should be able to move in early this summer. What is the best way to chase away those winter blues? Waking up the motorcycle from its long winters nap, firing it up to again to feel the wind in your face; of course! Nothing better than heading north to New Hampshire, pulling into the Welcome Center to take the helmet off while thumbing your nose at the Massachusetts Helmet Law. You have to appreciate the State allowing personal freedoms however this is the same state having State liquor stores located at motorist Safety Rest Areas! The Centers of Disease Control and Prevention states that preventing serious injuries and deaths from motorcycle crashes is a major and growing public concern. Snakes – New England claims 2 venomous snakes; the Timber Rattlesnake and the Northern Copperhead. Asparagus is a healthy spring vegetable and quite available at farm stands and grocery stores. When combined with tilapia, it makes for a tasty and healthy meal celebrating the spring season! Combine chili powder, garlic powder and 1/4 teaspoon salt on a plate. Dredge fillets in the spice mixture to coat. Heat oil in a large nonstick skillet over medium-high heat. Add the fish and cook until just opaque in the center, gently turning halfway, 5 to 7 minutes total. Divide among 4 plates. Immediately add lemon juice, the remaining 1/4 teaspoon salt and asparagus to the pan and cook, stirring constantly, until the asparagus is coated and heated through, about 2 minutes. Serve the asparagus with the fish. Per serving: 211 calories; 10 g fat ( 2 g sat , 6 g mono ); 57 mg cholesterol; 8 g carbohydrates; 0 g added sugars; 26 g protein; 4 g fiber; 419 mg sodium; 681 mg potassium. Nutrition Bonus: Vitamin C (37% daily value), Folate (33% dv), Iron (33% dv), Fiber (24% dv).